Will you step up if you see a man physically abusing a woman in public? Thailand-based Youtuber My Mate Nate conducted a social experiment to see whether Thais will react to domestic violence. “In 2016, 1 in 3 Thai homes will deal with domestic abuse. If you see something would you help?,” says the video’s opening line which was made to raise awareness of the issue. 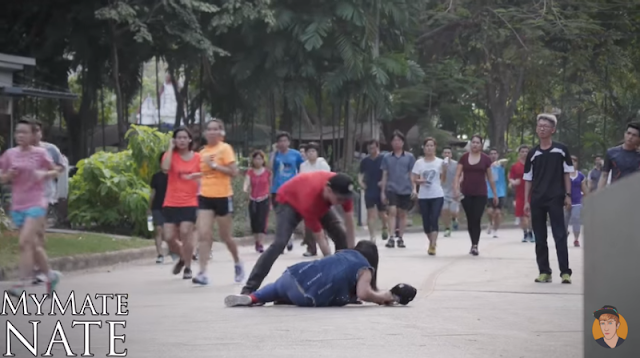 The first scene showed a couple, a Western guy and a Thai woman in a park. The woman was put in a headlock by her boyfriend and was then hit in the area of the park where most people were keeping themselves fit. However, people simply stared, ran past and did nothing. Same thing happened in the next shot when a man forcefully tries to make a woman move down the street. And guess what? Someone finally made a move – a Western man – which you can see at 1:03. There were so many people who did nothing and simply ignore what was happening before their very eyes. You can see two girls who stared at their phones when the couple were fighting in front of them. Joggers on the other hand chose to run around a couple as a man assault his girlfriend. “Don’t interfere in a matter of a husband and wife – Most Thai’s think this way,” says the top comment on Youtube. The video was uploaded on 25 March and has been viewed more than 400,000 times at the time of writing. Previous Previous post: Songkran: Tax deductions on your food and hotel receipts | Keep them!